The scene at the Garland Street Fair in 2017. A year and a half later, the event was dead. The Garland Street Fair, in its 16th year, was as crazy as it had ever been last August. Thousands packed a few blocks for hours. There were over 160 vendors, ranging from Steampunk artists to an electric bike rental shop to organic garlic farmers. Car lovers showed off their hot rods at Garland's annual car show. Bands played honky-tonk, country western, retro-pop, folk and marimba music. On Wall Street alone there were martial artists, acrobats, belly dancers, Irish dancers and breakdancers. It would have been hectic enough, even if the anti-abortion protestors hadn't shown up. Julie Shepard-Hall, the street fair's head organizer, says they were screaming through megaphones and waving grisly signs. "Some of vendors left because it was so bad," Shepard-Hall says. "We've got protesters showing mangled babies in the kids area and [animal-rights activists] writing in chalk on the street that 'dairy kills cows' in front of the Milk Bottle." The protests were just one more raindrop in the monsoon of stress pelting the street fair. And so earlier this year, Shepard-Hall and other organizers made a decision to cancel the fair this year. 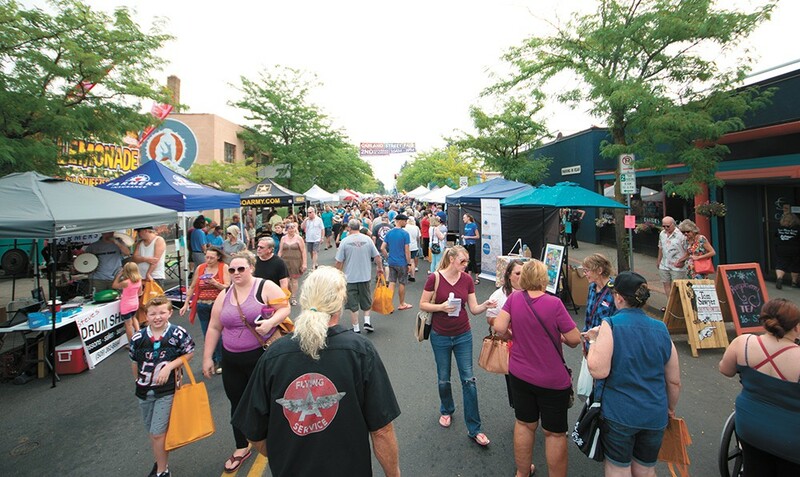 In doing so, the Garland Street Fair joins the list of beloved cultural events that suddenly came to an end, including Elkfest, the Browne's Addition music festival, and First Night Spokane, the New Year's Eve event. It wasn't that last year's event was unsuccessful. In many ways, it was the opposite, argues Garland area pastor and coffee shop owner Rob Bryceson, who helped put on the street fair. The Garland Street Fair had become too big of a hit, too massive for a handful of volunteers in a small Spokane business district to handle for long before being burned out. "Last year's festival was 14,000 people in the neighborhood," says Bryceson. "I guess I'd use the phrase, 'too much of a good thing.'" For five years, the bulk of the Garland Street Fair had rested on Julie Shepard-Hall's shoulders. "I'm here from 4 in the morning to 11 at night," Shepard-Hall says. "I have to make sure every barricade is picked up. Every piece of garbage is picked up." And that's just for the event itself. "It consumes your life for six months," Shepard-Hall says. "Literally every day I was working on Garland stuff." Shepard-Hall had to manage hundreds of applications from vendors. The organizers had to recruit and coordinate bands, negotiate with the fire marshal, handle marketing, run their finances, coordinate volunteers and decide the layout of booths, portable toilets and barricades. On top of all that, Shepard-Hall owned two businesses — Integrity Insurance Solutions and a women's consignment clothing shop. "Last year I literally thought I was going to have a heart attack," Shepard-Hall says. "Everything has to come together all at once and you don't have enough chiefs you can delegate to. And everyone is going 'Julie! Julie! Julie!' When all of that this coming on you all at once, it's just overwhelming." Theoretically, the Garland Street Fair could have scaled back. Emily Wenzel, president of the South Perry Business and Neighborhood Association, says the Perry Street Fair eliminated its parade to cut down on the time and energy it took to plan their event. But Bryceson argues that it's difficult to not want to try to exceed fairgoer expectations by raising the bar every single year, until the event becomes unsustainable. "There is a pressure to add more, add more: Let's be better than next year than we were this year," Bryceson says. "And then it just becomes massive issues of crowd control and restrooms and cleanup and safety." Those were all surmountable challenges, he says, if they had the volunteers. But finding them was becoming more and more difficult. It wasn't just finding a few extra hands — it was finding organized people to help lead them. The street fair's volunteer coordinator had been unable to do the event last year. The struggle to find volunteers for a growing event was also a factor in last year's demise of First Night Spokane, downtown's New Year's Eve block party. "We can't keep doing this without additional help, and to get additional help we can't afford it," says Lona Barnum, former executive director of First Night. "You surpass your ability to put on a good event." After years working with the Garland Street Fair, meanwhile, Shepard-Hall says, she just needed a break. And this time, there was no one to take a hold of the baton. She says she talked to some of the paid professionals who put on Pig Out in the Park and Valleyfest about the possibility of taking over the reins. "But then it no longer is a Garland District thing," Shepard-Hall says. "It becomes another organization just using our space to have an event. Does it lose the Garland feel to it?" And there was a bigger issue, she says, beyond volunteer or staffing levels. Maybe the street fair itself was the problem. "Is it just not having enough people to organize or volunteer?" Shepard-Hall says. "Or is it about: Have we become too large? And do we need to step back?" The closest thing the Browne's Addition Neighborhood had to the Garland Street Fair was Elkfest, the three-day music festival held near the Elk Public House for 13 years. That is, until last year. At first, it seemed like the problem was all about the fire marshal and the Police Department. The city fire marshal said the Elkfest stage setup was breaking the fire code, while the city also determined the festival would need to start paying $4,500 for four police officers to provide additional security. But as Elkfest founder Marshall Powell began appealing with the city, they discovered something else: The festival wasn't quite as beloved as they thought. Not only were some neighbors complaining about the noise and nuisance, neighboring businesses like Rosauers and Italia Trattoria had their own frustrations with the event. "It had grown too big," Powell says. "Had it stayed smaller, it wouldn't have been on people's radars." He wasn't about to hire lawyers to try to force an event upon local businesses if they weren't enthusiastic about it. "There's 80 businesses at the district. And there's five of us doing the work to put that festival on," Bryceson says. "So, in the end, it was like: Is the district as a whole really wanting this festival? Or is it becoming a little bit of a headache?" There's always a point where bigger crowds increase problems without increasing the profit. A restaurant can only serve so many tables at once. Some restaurants, Bryceson says, were frustrated that they had to scale down their menus to be able to meet the demand — and were unable to showcase the full breadth of their restaurant experience. Other businesses felt they were buried behind a wall of food trucks and vendors set up out front. "Some of the music stores were like, 'I'm spending all day preventing shoplifting,'" Bryceson says. A few simply closed that day. Maybe there was a tipping point, Bryceson speculates. Maybe 5,000 or 7,000 visitors is a boon for the neighborhood, but when you get to 14,000, it's a nightmare. Officially, the Garland Street Fair is dead. It's possible it could be resurrected in a future year, Bryceson says. But for now the plan isn't to revive the street fair so much as to divide it. The Garland District Business Association is thinking that instead of just one mega-event, why not have three or four smaller events throughout the year? A car show in April, maybe. An art show in June. A music festival in September. The one date that Bryceson wants to be sure to avoid, however, is the second Saturday of August. The original print version of this article was headlined "Victims of Their Own Success"